PHOENIX – When Park Central Mall opened in 1957, the cars packed into the parking lot had fins, Elvis Presley’s “Jailhouse Rock” was on the radio and shoppers were riding the escalators at a gleaming, two-story Goldwater’s department store, founded by the family of the man who would run for president seven years later. The mall was two miles from downtown, perched on the edge of Phoenix, a city of about 100,000, and rose to a success that belied the naysayers who had claimed people would never travel that far. About 1.5 million people later, the shine on the once-vaunted mall has dulled, its anchor tenants long gone, with the gravitational pull of retail rippling to the edges of one of the nation’s largest metro areas and onto the web. Developers and Phoenix planners are plotting a comeback. They dream of transforming the state’s oldest mall into creative work spaces, more restaurants and shops. One day, very soon, they say, Park Central will draw crowds again. “I think it’s going to turn into the hip, cool new place to hang out,” said Christine Mackay, with the city of Phoenix. Goldwater’s, owned by the family of Republican Sen. Barry Goldwater, Diamond’s, and J.J. Newberry’s were anchors for the mall, according to Labelscar, a retail history blog. “For a time, Park Central was the center of the Phoenix retail scene. During the 1960s, a number of new high-rise office and apartment buildings sprang up in the immediate vicinity of the mall, pulling the city’s center of gravity north and quickly becoming the de facto ‘city center’ of Phoenix,” Labelscar said in a 2011 post. But as the population grew and expanded in the Valley, the luster wore off. Development has grown in the area now known as Midtown. But Mackay, Phoenix’s director of community and economic development, said it’s as if the mall at Osborn Road and Central Avenue is the hole in the middle of a donut: as office high rises, condos and restaurants that rose nearby Park Central remained stagnant. 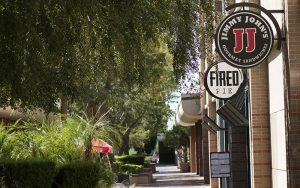 The mall now houses a few businesses, including a shoe repair shop and jewelry store, and chain restaurants such as Fired Pie, Jimmy John’s and Jamba Juice. On a recent afternoon, only a handful of people, dressed in work clothes, were at Park Central. “It feels like a dead spot. When you get there nothing really happens,” Mackay said. Making Park Central cool again? Harper, chief executive of Plaza Companies, said the Plaza and Holualoa real estate firms bought the 46-acre mall with hopes of turning it into a multi-purpose paradise. “We will be creating a number of indoor-outdoor spaces where people can gather, where they can connect, where they can meet to talk about business opportunities to enjoy the environment,” Harper said. The mall will be designed to retain a retro feel. Developers will be “transforming it to the 21st century but recognizing what it once was, appreciating what it once was, and celebrating that in a new way,” she said. Harper said one idea is to pay homage to the mall’s roots. “In the basement of Park Central we found a treasure trove with all this history. Some of the signage and iconic logos that were used, we want to bring that back whether it’s with artists, with a mural or in different ways to preserve that,” Harper said. 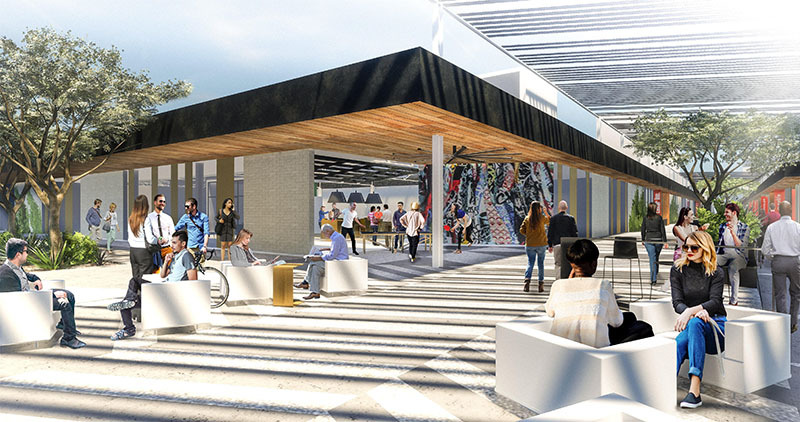 A shaded outdoor walkway will greet shoppers, dine-in restaurants will have outdoor seating, and stores and office will feature wide, rolling garage doors, Mackay and Harper said. They want the mall to have an open air, energetic vibe. Expect things like a martini bar, Mackay said. By summer, expect “shaded outdoor landing space with cool restaurants,” Mackay said. But, for the vision to happen, the mall needs new tenants. Even as malls across the country are losing ground, Park Central joins other Arizona malls like Arizona Center and Scottsdale Fashion Square that are refurbishing designs and polishing off new attractions to lure the public. Mackay said the city and developers are in talks with potential tenants. They did not provide specific names but said they had an eye out for entrepreneurs for the office spaces. “I think those tenants are going to be very creative tenants, probably software development, software design, web design. You’re going to see probably creative architectural and engineering type firms. You’re going to see some big startups that have come out of their first generation space and are looking for their next landing space,” she said. By fall 2018, Mackay and Harper said, the mall will have plenty of tenants and, hopefully, the crowds to match. “Park Central will once again be the glorious hub it once was,” Harper said.